A long time ago, in a place far away, I quilted with a lovely group of ladies in Beaumont. Alberta, that is, not Texas! Before we moved south to Calgary, we started an exchange of row by row quilts. Each of us started a quilt with a row of blocks, passed our blocks on to the next person on the list and they were to add a row. Unfortunately, the quilts stalled on their journey around the group and finally, 8 or 9 years after they were started, I got my quilt top back! And now, after sitting in my UFO pile for a few years, it's time to finish it. 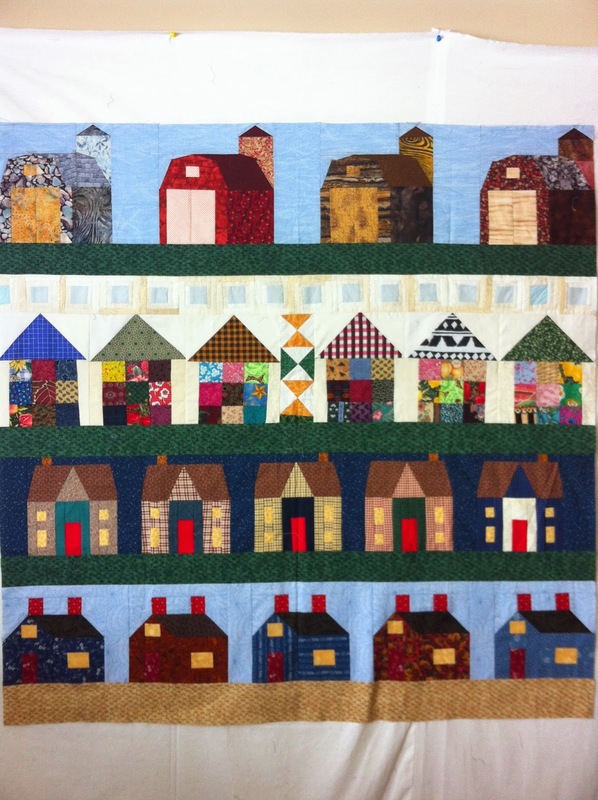 The theme for my row by row quilt was houses. I love that this quilt has pieces of my friend's creativity and look forward to finishing it. I have some lovely earthy prints to border it with and am thinking of adding some flying geese blocks to the top. I also am thinking of putting "Home Sweet Home" somewhere on it as well - not quite sure where that will turn up, but I'll think of something! Have you had a project with an extremely long shelf life? What do you need to motivate you to get it finished?